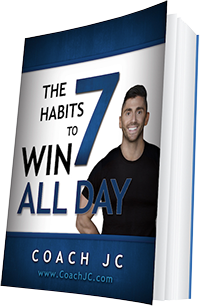 Today’s WINNING recipe to meet Coach JC’s 10 WINNING Habits is Grilled Chilli Lime Chicken Fajita Salad. Where are my veggies? Where is my lean protein? 1. Whisk marinade ingredients together to combine. Pour half the marinade into a shallow dish to marinade the chicken for two hours. Refrigerate the reserved untouched marinade to use as a dressing. 2. Heat about one teaspoon of oil in a grill pan or skillet over medium-high heat and grill chicken fillets on each side until golden, crispy and cooked through. Could grill on outside grill. 3. Wipe pan over with paper towel; drizzle another teaspoon of oil and for pepper and onion strips until cooked to your liking. 4. 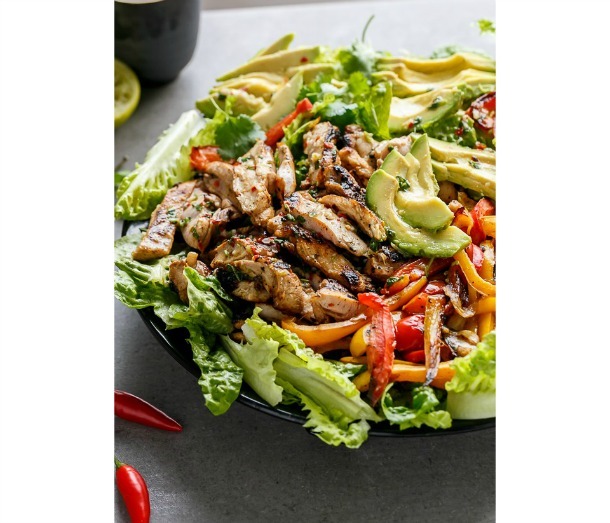 Slice chicken into strips and prepare salad with leaves, avocado slices, peppers, onion strips and chicken. Drizzle with remaining marinade/dressing and serve with extra cilantro leaves.